In October 2016 two of us teachers, from Vedavalli Walajapet and Ranipet, attended a workshop on the “Foldscope” organised by the Tamil Nadu Science Forum at the Institute of Mathematical Sciences, Chennai. The workshop was conducted by Prof. Sankaran Krishnaswamy. The foldscope is a low cost paper microscope developed by the Prakash Lab of Stanford University, USA. At the workshop we assembled the foldscope with its “low magnification” (140 X) lens. We learnt to use the foldscope to view dry samples. We have uploaded some of our images made at Vedavalli Walajapet on the Microcosmos website. Here are the images that we have uploaded! We were told that the foldscope could be used by children in the age group 10-14. Our children of Classes III to VII have used it to observe the leaf of guava, legs of mosquitoes, legs of a cockroach, hair of human beings, thread, wings of a butterfly, tomato peel, onion cells and many other things. 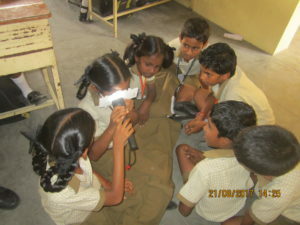 With students of Class V I used the foldscope to support the chapter, “Living together”. 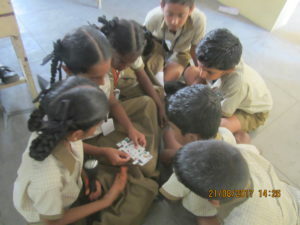 I started the class by briefing some basic information about the foldscope. 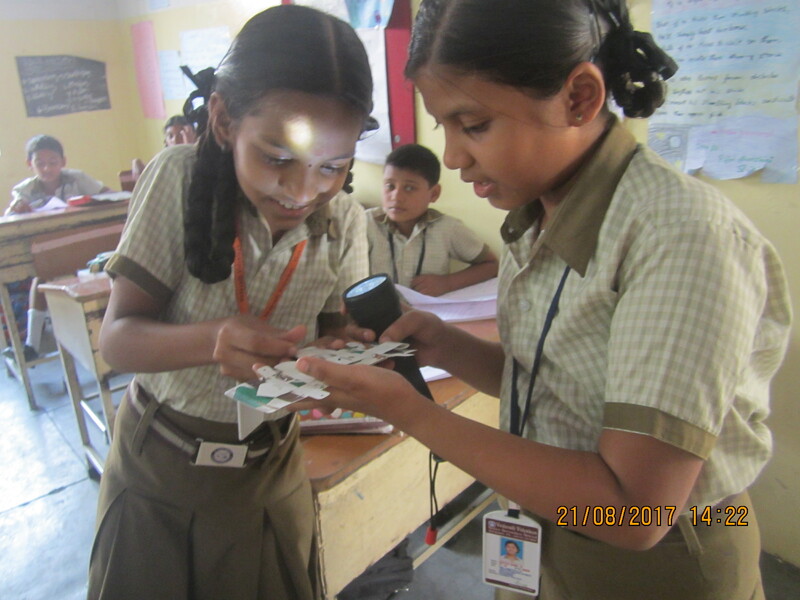 Students had questions about Dr. Manu Prakash who invented the foldscope, uses of the foldscope and what can be observed through it. I showed them how to prepare a slide of a solid dry sample and showed how by using one piece of tape instead of two to adhere the solid to the slide, the images appear sharper. Students eagerly awaited their turn to observe the insect’s leg through this foldscope. They expressed how they felt after observing the minute hair structures on the body of an insect. Students were amazed to see uncountable hair on the leg of a mosquito that looked like a comb. It was an interesting and exciting class.